It's been a long time since my college days, but my best advice is to enjoy every moment! The days might seem long, but you'll miss them when it's over. 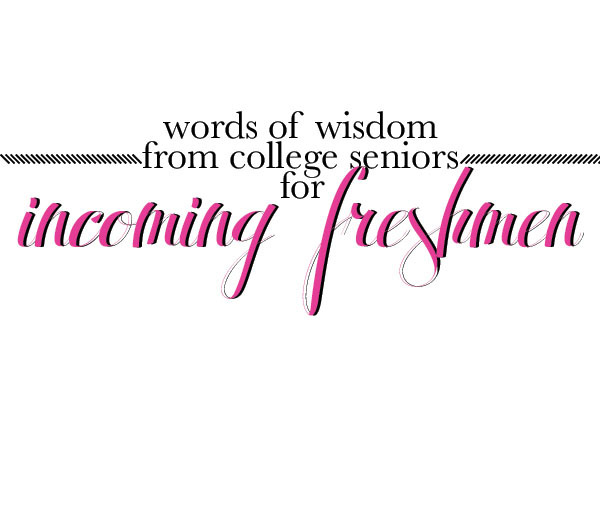 Best advice for college freshman is to have a well rounded experience. Travel, be active and savor the experience. Awesome advice. Great tips and totally agree to find a great group of people and enjoy your college experience. The years went by too fast for me, despite having been in college for 5 years. PS...loving the design of your blog!! I just graduated college and one thing I wish I'd known or been pushed to do is to first learn to balance school before adding things like work, friends and relationships. While I'm glad how everything turned out, I sometimes couldn't get my priorities straight because I wanted to be with my bf or work more. Great advice! There is a big change between high school and college. I wish I had looked up advice before I entered college. I bombed my freshman year hard because I just wasn't prepared for it. awesome post with some great advice! Having just graduated from college all this advice couldn't be any more true!